The north-east’s largest town has been injected with £305million of funding since 2017, new figures show. A further £200million of projects are already in the pipeline for Peterhead. Councillors Norman Smith and Dianne Beagrie, who head up the Buchan area committee, last night described the figures – released by the local authority – as proof the town has a “bright future”. The new fish market, expansion of the harbour and floating wind farm Hywind have been hailed for boosting the town in recent months. And with the new Peterhead Community Campus, care village and a much-needed revamp of Drummers Corner planned, the pair hope to attract more people to the area. Businesses are already seeing the potential, with Brewdog due to open a new pub and a new seafood restaurant confirmed for Broad Street. Central Buchan councillor Mr Smith said: “It’s sadly a north-east trait that people don’t want to shout about the positives. “They would rather dwell on the negatives, so what we really want to show is that Peterhead is a great place with a bright future that people should feel they can come to. “Until I saw the figures all drawn up I didn’t realise how much had been done. Aberdeenshire Council will be heavily involved in the investment for large-scale projects such as regeneration funding, the new community campus and the care village. The new Peterhead Academy is expected to be cost around £71million, and will include community sports and leisure facilities and a modern learning environment. A council spokesman said: “In the first half of 2019, a large piece of work will get under way which will result in a final decision on the location and scope of the campus project. “The council is proactive in their aim of getting the new school planning moved forward. “Although the finance dates of a timescale of 2023 to 2025 may seem far away, the preparation and planning works have already commenced. Meanwhile, a 65-bed care home with sheltered housing and a community cafe will be built to form an £8million care village in the town. Another major project for the town is the revamp of Drummers Corner, which could be complete as soon as the summer. Mr Smith said: “It’s exciting to see what’s going to happen in the future for the town. “This year, as chairman (of the Buchan area committee), I plan to work with collaboratively will all of the partners to invest in the Peterhead strategy and aim to attract more for the town centre. Mr Smith said the “icing on the cake” would be if calls to improve the A90 Aberdeen to Peterhead road beyond the dualling at Ellon were acted upon. A new initiative created to market the business opportunities in Peterhead has been set up in a bid to fill vacant commercial properties. Invest in Peterhead (IIP) is a new approach to tackling the empty business premises by a group of stakeholders. Rediscover Peterhead and Aberdeenshire Council finalised the strategy at the end of last week – the first time a joint attempt has been made. Chairman of Rediscover Peterhead John Pascoe explained the plans and how the start of the collaboration has been going. He said: “The strategy has just been finalised with all stakeholders including property owners, developers, property agents and architects. “The aim of the IIP initiative is to market the opportunities available within the town centre to investors, business owners, developers etc to try to fill empty business premises. 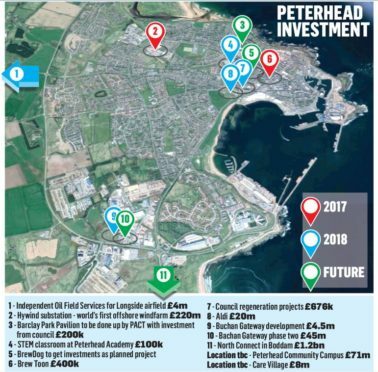 During the large scale investments, which Mr Pascoe said Rediscover Peterhead was “heartened to see”, BID has been working on more central initiatives. “Recent town centre investment includes a new Travelodge, Brewtoon Micro Brewery being established, Lettuce Eat Health extension, Aldi supermarket now open and Shepherds Chartered Surveyors relocating their office to within the town centre. “Imminent developments include Brewdog opening a bar in Drummers Corner and a proposed fish restaurant and offices in Arbuthnott House, as well as the redevelopment of the Drummers Corner area by Aberdeenshire Council. “We work generally in a collaborative way with various companies and organisations, with the council being one of the key partners. “This has taken the form of jointly funded projects such as the Seafood Festival.